At the moment, every time I apply my makeup, there are four non-negotiable products that I reach for. Eyeshadow, blush, base and lip options may vary but at the moment, I am obsessed with these products. I know that I can depend on them for my makeup to look its best. Two are new to my collection and two are old favourites. Anastasia Beverly Hills Dip Brow Gel: I bought this just a few weeks ago and already can't be without it. Doing my brows has always been my least favourite part of doing my makeup but I actually really love doing them now, thanks to this product. I use my Brow Wiz first and then I finish with this Brow Gel. I personally prefer to use a slanted brush to ensure that I don't apply too much product but obviously you could apply using the wand if you prefer. It's easy to make my brows look fuller, it adds definition and once applied, is completely budgeproof until I remove it. Best brow product ever and one that I will repurchase forever! Erborian CC Eye Cream: I love that this eye product has an SPF in it (20, by the way) - all eye creams should contain SPF! This one nourishes, smooths and adds some coverage to the under eye area. For those with extremely dark circles, this may not provide enough coverage but it would still work well as a base, pre-concealer. I wear this on a daily basis, whether I am wearing makeup or not because it brightens my under eye area without looking heavy and it also moisturises the area. It looks white when initially applied but when blended in, it adjusts to your skin tone. Brilliant product! 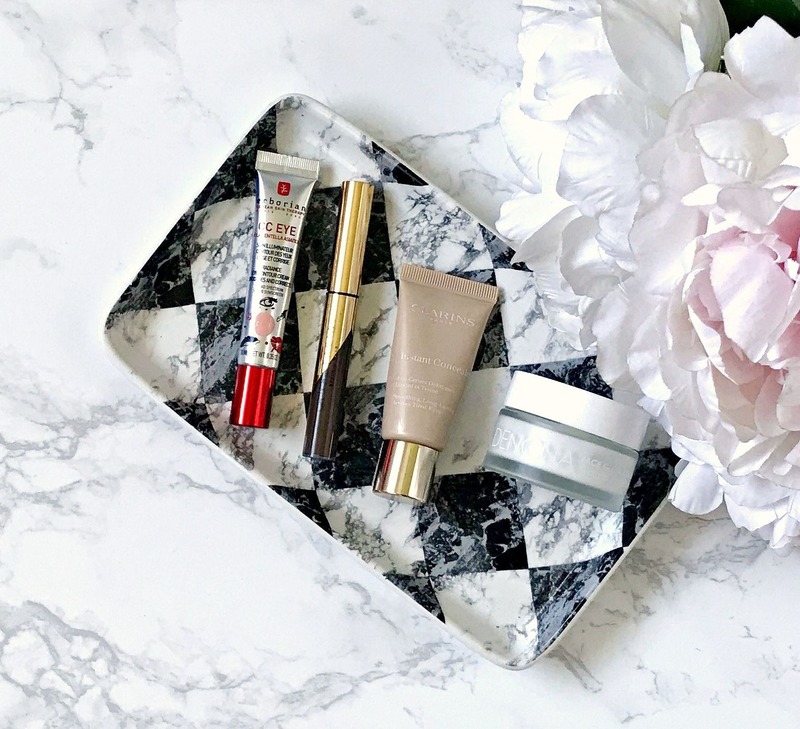 Clarins Instant Concealer: This is such an under-rated product and I really don't know why because it's brilliant. Light in texture but with medium to full coverage, this blends seamlessly into the skin. It doesn't feel heavy, doesn't cake or crease and is really long-lasting. It covers areas of redness and blemishes without the need for a lot of product. The only negative is that it's only available in 4 shades. Natasha Denona Hydrating Glow Primer: Regular readers will know that I have dry skin so I always use a hydrating primer and this is one of my favourites. It absorbs very quickly but moisturises the skin well and every foundation I use applies beautifully over it because it leaves my skin plump, smooth and hydrated. What I love most is that it keeps my skin feeling that way for hours after application. If I could use this daily as my moistursier, I would. Instead, I settle for using it as a primer because there is only 30ml in the pot and it isn't the easiest to get hold of. Have you tried any of these products? What are your current most reached for products? I'd love to hear! All products are bought by me, unless otherwise stated. The Erborian product was kindly sent to me. Opinion is always my own. Affiliate links may be used.